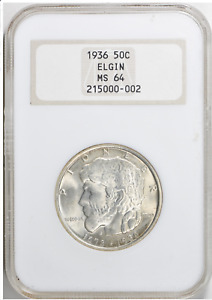 Although the Elgin half dollar was conceived partly to commemorate the founding of Elgin, Illinois, this theme is not readily apparent when studying its design: Nowhere does it make reference to the actual centennial dates of 1835-1935. 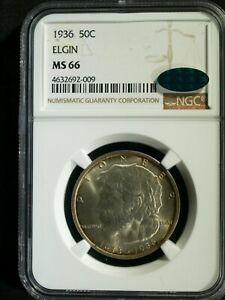 In truth, the centennial of Elgin was subordinate to the more urgent goal of this coin in raising funds for the completion of the Pioneer Memorial sculpture depicted on its reverse. This well-intentioned campaign was only marginally successful, however, and sculptor Trygve A. Rovelstad's epic work remained uncast until quite recently, even though its foundation was laid in 1934! The town of Elgin, Illinois was settled in 1835. It lies about 30 miles northwest of Chicago on the Fox River and was incorporated as a village in 1847, as a city in 1854. Although a major dairy center, with a variety of industries as well, the city of Elgin is largely unknown to persons outside of Illinois aside from periodic mention of the once-famous Elgin Watch Company. Davidson Park, on Elgin's east side, was the site selected for Rovelstad's monumental (12 feet tall) sculptural group depicting a pioneer family. The pedestal for this work was completed as part of a government sponsored relief project during the Great Depression of the 1930s, but the funding necessary for casting in bronze (then estimated at $75,000-100,000) was not forthcoming. Learning of how other civic projects and celebrations were funded through the sale of commemorative coins, sculptor Rovelstad urged his Congressman to draft appropriate legislation for a coin featuring his Pioneer Memorial. (It would be little work for Rovelstad to create the models himself, as he had already performed similar work for the Elgin Centennial Medal of 1935.) 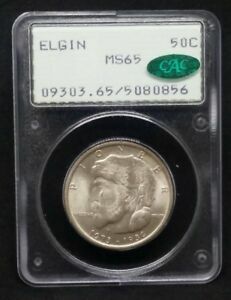 A bill introduced on May 27, 1935 called for the coining of not more than 10,000 half dollars commemorating the centennial of Elgin and the erection of the Pioneer Memorial. Inclusion of this monument within the coin's design was specifically called for in the language of the bill. 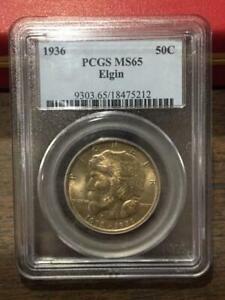 The management of coin sales was assigned to the Elgin Centennial Monumental Committee. Who belonged to this committee beyond Trygve Rovelstad is not known. Rovelstad's proposal languished in committee for many months, while the centennial of Elgin came and went. When all seemed lost, a savior appeared in the form of one L. W. Hoffecker of El Paso, Texas. Hoffecker was already known to the numismatic community as a part-time coin dealer and the promoter/distributor of the Old Spanish Trail commemorative half dollar. 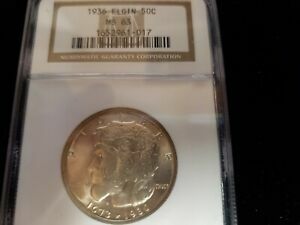 Reading of Rovelstad's efforts to achieve an Elgin coin, Hoffecker contacted the sculptor with the following offer: In return for being selected as the sole distributor, Hoffecker would use his knowledge of the commemorative coin process to ease the passage of the Elgin bill. After some weeks of negotiation, during which Hoffecker spelled out his credentials and assured Rovelstad that his handling of the program would be fair and equitable, an agreement was reached in which the promoter was permitted to purchase the entire issue at face value. 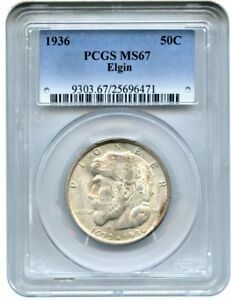 In return, Hoffecker pledged to sell the coins at not less than $1.50 apiece, splitting the profits with the Elgin Committee. 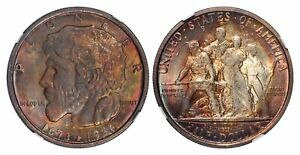 With each coin selling at $1 over its face value, 65 cents would go to the committee and 35 cents to Hoffecker, the latter assuming all costs associated with manufacturing the coins, their shipment from the mint, and their delivery to customers. 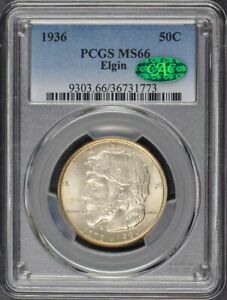 Although Hoffecker professed that collectors would find no reason to complain about the way in which the Elgin coins were distributed, he nevertheless remained sensitive to their perception of some commemorative programs as outright rackets. Writing to Rovelstad in October, 1935, he advised "It would not be good for either of us if the word got out you had disposed of the entire issue to me." Despite his previous experience, Hoffecker was unable to get the Elgin bill passed until June 16, 1936. 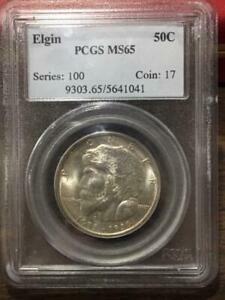 By then, the desired mintage of 10,000 coins had been upped to 25,000 by a Congress now quite wary of speculators. 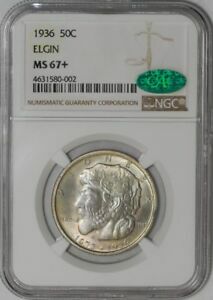 The Elgin issue was included in an omnibus act which also provided for the Albany and Gettysburg coins. 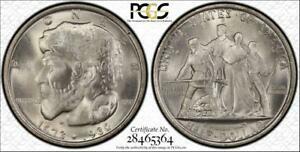 Sensing that 25,000 coins would be difficult to sell, Hoffecker attempted to have them struck at all three mints, thereby prompting collectors to purchase complete sets. This effort was foiled by the language of the bill, which specified only one mint. In his desire to reduce the shipping cost to El Paso, Hoffecker then sought to have the entire issue struck at the Denver Mint, but again to no avail. In the meantime, Trygve Rovelstad submitted his sketches to the Mint, which forwarded them to the Federal Commission of Fine Arts on July 15, 1936 for review and approval. 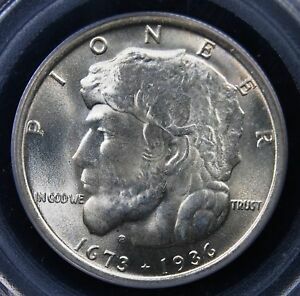 Their preliminary response was positive, with the stipulation that the head of the pioneer on the obverse be shown in profile, instead of in a three-quarter perspective. Rovelstad then completed his plaster models, incorporating the desired change. The Commission's sculptor member, Lee Lawrie, found no major fault with the models, although he urged some reinforcement of the lettering. 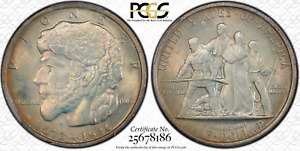 In their revised form, they were approved August 21 and were immediately sent to Medallic Art Company in New York City for reduction to coin hubs. 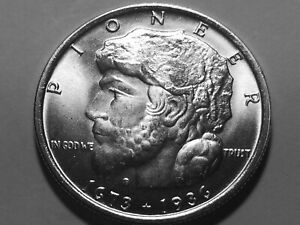 The obverse of this coin displays a profile bust of a pioneer man, whose full figure is repeated on the reverse as part of a grouping which also includes his wife and baby, as well as their grown sons. Aside from the motto IN GOD WE TRUST, the obverse features the word PIONEER, Rovelstad's monogrammed initials and the dates 1673 1936. The latter date is self explanatory, but the earlier date refers to an entirely irrelevant event, the first European exploration of Illinois by missionaries Jacques Marquette and Louis Joliet. The reverse is dominated by a slightly modified rendition of Rovelstad's Pioneer Memorial, lacking its monumental, inscribed base. Most of the lettering is mandated by law: UNITED STATES OF AMERICA, HALF DOLLAR, LIBERTY and E PLURIBUS UNUM. The statuary is identified in tiny letters: PIONEER MEMORIAL and ELGIN, ILLINOIS. 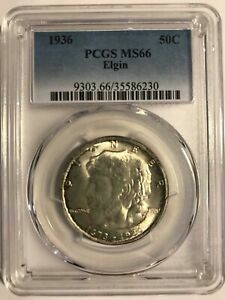 The entire mintage of 25,015 Elgin halves was struck at the Philadelphia Mint in October (the odd 15 pieces being reserved for assay). Hoffecker received the coins from the Mint on October 11, and he shipped out all of the existing orders just two days later. In addition to the pieces sold by him via mail orders, lesser quantities were distributed by local banks, and even the Elgin Watch Company ordered 100 pieces for promotional purposes. Sales soon slowed to a trickle, however, with about 5,000 pieces still on hand. Hoffecker requested that he be allowed to retain these leftovers at their face value, rather than returning them to the Mint for melting. His offer was declined by Rovelstad, and exactly 5,000 coins were turned in for destruction, leaving a net mintage of 20,000 pieces. Trygve Rovelstad netted about $8,000 from the sale of the Elgin halves, but without additional funding, it provided only a temporary boost to his project. 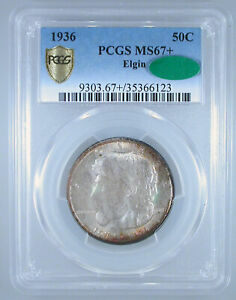 The typical Elgin half dollar displays a matte like frost, although some will be more brilliant, and a very few will possess an attractive, satiny sheen. 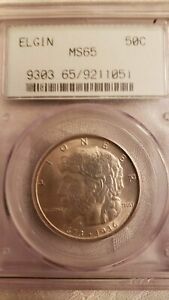 This issue is rarely, if ever, found fully struck in the highest points of obverse and reverse. The infant held in its mother's arms is almost always indistinct. 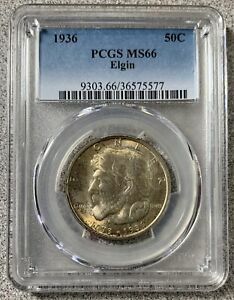 This fact, combined with contact marks and the often lackluster quality of this issue as made, keeps most pieces in the range of MS-60 to MS-64. 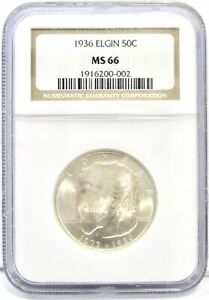 Still, MS-65 coins are not rare, and even those grading slightly higher are sometimes available. 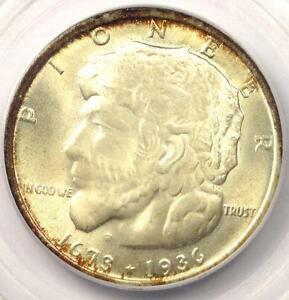 Worn examples are unusual, but always check for such wear on the pioneer's cheekbone or the rifleman's left shoulder. The first ten Elgin halves coined were presented to Trygve A. Rovelstad. At least a few of these were dipped in acid by and for the Mint's Chief Engraver, John R. Sinnock. Despite having the surfaces of a matte proof, the one known example does not possess the striking quality of a proof. Whether or not any truly double struck, matte proofs survive is unknown. One collectible tie-in item is available to interested hobbyists: This is the original packaging in which this coin was delivered. It consists of a plain insert with either five or six holes, delivered in a cover that is usually stamped with the return name and address of L. W. Hoffecker. Unstamped holders are often accompanied by a covering envelope with this same information and cancelled postage affixed.